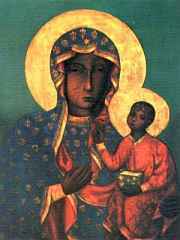 The Black Madonna of Czestochowa (Czarna Madonna or Matka Boska Czestochowska in Polish) icon was, according to legend, painted by St. Luke the Evangelist on a cypress table top from the house of the Holy Family. One of the oldest documents from Jasna Góra states that the picture travelled from Jerusalem, via Constantinople, to finally reach Czetochowa in August 1382. The Black Madonna is credited with miraculously saving the monastery of Jasna Góra (English: Bright Hill) from a Swedish 17th century invasion, The Deluge, which actually changed the course of the war. This event led King Jan Kazimierz to crown Our Lady of Czestochowa (the Black Madonna) as Queen and Protector of Poland in the cathedral of Lwów on April 1, 1656. Czestochowa is a city in south Poland on the Warta River with 248,894 inhabitants (2004). Situated in the Silesian Voivodship (since 1999), previously capital of Czestochowa Voivodship (1975-1998). This town is known for the famous Paulite monastery of Jasna Góra that is the home of the Black Madonna painting, a shrine of the Virgin Mary. Every year, thousands of pilgrims from all over the world come to Czestochowa to see it. There is also a Lusatian culture excavation site and museum in the city and ruins of a medieval castle in Olsztyn, approximately 15 kilometres (ca. 10 mi.) from the city centre. The Jasna Góra Monastery (pl. Jasna Góra) (lat. 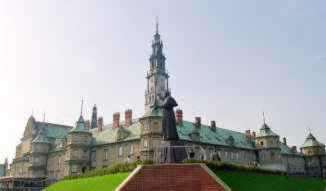 Clarus Mons) (English: Bright Hill)- a monastery of Paulists in City of Czestochowa. The most important icon of Mary, Mother of God in this part of Europe and pilgrimage destination for hundreds of years. In the premises of the monastery there is a Holy Picture of Mother of God with Christ Child, known as The Black Madonna of Czestochowa or Our Lady of Czestochowa, which is credited with many miracles and widely venerated. The Black Madonna is credited with miraculously saving the Jasna Góra monastery from a Swedish 17th century invasion, The Deluge, which actually changed the course of the war. Shortly after, on April 1, 1656 Jan Kazimierz, the King of Poland, in the cathedral of Lwów, solemnly pronounced his vow to consecrate the country to the protection of the Mother of God and proclaimed Her the Patron and Queen of the lands in his kingdom. The Black Madonna Shrine, Missouri. The Black Madonna Shrine and Grotto is a shrine located in the unincorporated area south of Pacific and Southwest of Eureka in the state of Missouri, United States. It was constructed in 1938 by Brother Bronislaus, a Polish native, of the Franciscan order. The shrine is dedicated to Our Lady of Czestochowa and is a replica of the shrine in Czestochowa. The image is referred as the Black Madonna because of its dark brown skin tones. The shrine has been subjected to arson and vandalism many times in its history such as in 1958 when an arsonist set fire to the altar which burned the chapel. Some of my photos showing the Black Madonna Shrine at Jasna Góra Monastery, Czestochowa.